The statement from Pakistan saber rattling with was the result of India, with evidence, blaming Pakistan-based terrorists for the attack at the Uri army base that killed 19 Indian soldiers. 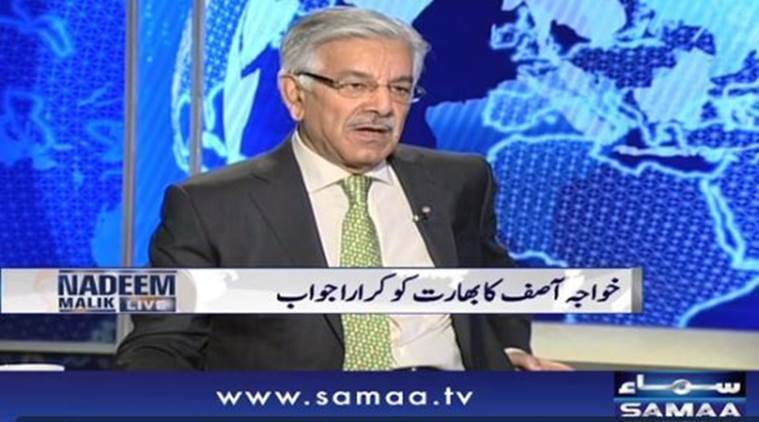 Pakistan Defence Minister Khawaja Muhammad Asif in an interview with Samaa TV. So now Pakistan responds and threatens India that if takes action, that they reserve the option to retaliate with a nuclear attack on India. So how possible is it that Pakistan and India could have a nuclear war? After all Iran yesterday threatened to wipe Saudi Arabia off the face of the map when special Adviser to the commander of the Iranian Armed Forces, Major General Hassan Firuz Abadi on Tuesday threatened to “erase Saudi Arabia and the Wahhabis from existence”. But no one is sure if Iran built its nuclear warheads. India however has 118 warheads, Pakistan has 130. China, across the Himalayas has 180 — 263 if we include the DF-26 waiting dismantlement. China, for instance, has around 25 DF-31A ballistic missiles with a range of 11,000+ kilometers. In other words, the ability to hit targets in the US. But the real costs would be higher and not just in India and Pakistan, where the first 21 million people–half the death toll of World War II–would perish within the first week but another two billion people worldwide would face risks of severe starvation due to the climatic effects of the nuclear-weapon use in the subcontinent, according to this 2013 assessment by the International Physicians for the Prevention of Nuclear War, a global federation of physicians. The way one can predict the outcome of things is to study the track record, if chaos happened in a corrupt nation with such an abysmal record as Pakistan, the rule is, that chances of worse repetitions are not far off. Pakistan is the only country that leaked and transferred nuclear technology to the countries that are still under UN and US sanctions. It is also the only nuclear state that shelters and protect terrorist organizations such as Al-Qaeda, the Taliban, Haqani Network. The Pakistani nuclear scientist Abdul Qadeer Khan, leaked nuclear secrets to North Korea, Libya and Iran. Abdul Qadeer Khan not only accepted the full responsibility for transferring sensitive technology to mentioned states but he also revealed in 2004, that the former military ruler, General Pervez Musharraf, the top authority in Pakistan himself was involved neck-deep in nuclear proliferation. And all we need is some incident like Pakistan needs is a trigger happy leader and we will have a nuclear catastrophe where the world will end up in starvation mode. It is not a question of if, it is a question of when.